The cultural narratives enacted by public spaces play a huge role in how we lives our lives as citizens of the nation-state. A myriad of communicative processes play out simultaneously between passing bodies and the structures of the built environment: hyper-visible yet unspoken, dynamic yet immobile. These set pieces upon which the stories of our lives are projected are far more than mere background, but in fact an integral component of the self. 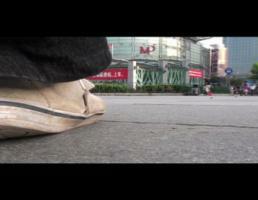 While staging a video work in the People’s Square in Shanghai, China, investigating the power of narrative plot lines in the conduct of daily life, Watkins prostrated her body on the pavement. Doing so, she tapped into concealed infrastructures of urbanism and identity, setting off a violent spectacle of public participation.